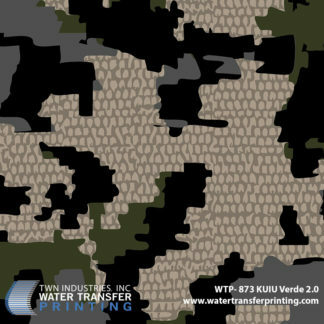 Princeton, FL – December 13, 2016 – TWN Industries Inc., the leading Water Transfer Printing supplier is proud to announce its partnership with KUIU Ultralight Hunting to bring you two newly revamped camouflage hydrographic films. KUIU Vias 2.0 and KUIU Verde 2.0 both received improvements to their design, allowing you to blend in by utilizing their proprietary camouflage technology. KUIU Vias received a facelift in 2014. The new design features darker tan background colors, a second shade of gray, and elongating portions of black, which enhance contrast and break up your silhouette at greater distances. KUIU’s objective in the Vias 2.0 update was to make the pattern more effective in a broader range of environments. Likewise, Verde 2.0 is an updated version of KUIU’s original version released in 2012. Verde 2.0 features more open space and contrast, making it extremely effective at varied distances. This gives it the upper hand compared to tighter, micro-patterns which can appear monochromatic. Enhancements to the pattern include an added black coloring, a lighter gray hue, and an increase in the overall size of each color block. Additionally, sharp edges found throughout the pattern were rounded off in order to reduce an overly “digital” appearance. This provides Verde 2.0 with a more natural appeal in the field. As a result of these improvements, Vias 2.0 and Verde 2.0 will replace their older counterparts in all TWN hydrographic films. Previously, Vias and Verde Water Transfer Printing film patterns were scaled to 45% of the original size engineered for fabric. This reduction in size allowed for an appropriate scale on firearms, bows and related accessories. Now, Vias 2.0 and Verde 2.0 hydrographic film patterns are scaled to 75% of the original fabric size. 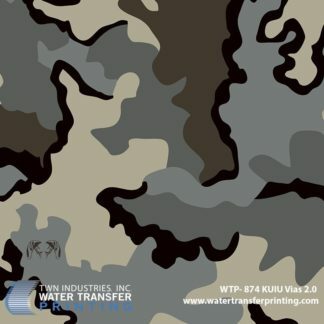 This will enable Water Transfer Printing projects on a wider range of hard goods to match more closely with official KUIU® apparel and thus, enhance overall concealment. How Did KUIU Get Started? KUIU was created to provide mountain hunters all over the world with premium, lightweight clothing that is tested and built for performance in extreme mountain conditions. KUIU was founded in 2011 by Jason Hairston, an avid hunter that pursued his dream after a neck injury derailed his NFL career. Jason had one goal in mind: “Make the lightest and highest performing mountain hunting clothing possible”. To this day, KUIU still embraces this vision and has built a brand that stands for uncompromised quality, performance, and value. Hairston studied the camouflage patterns found on African wild dogs. He realized that they were incredibly hard to see not because their camouflage mimicked their surrounding environment, but because of the vast contrast in their color palette. As a result of this superior camouflage, the African wild dog is the most successful predator on the African continent. Hairston soon realized that other top predators shared this same trait; stark contrast between colors was a consistent theme in leopards, tiger, snakes, and even fish. This idea inspired Jason and soon became the foundation behind KUIU’s Vias pattern. “The prey we are hunting can’t see colors, it’s all about contrast,” Hairston states. When developing a new pattern, Hairston studies the environment he intends to use it in, prints out large cards of test pattern, and takes them into the field for rigorous testing trials. Patterns are tested in a range of different environments and in low light and bright sunlight conditions. This agile methodology ensures new iterations of each pattern perform better than the last. KUIU’s dedication to continuous improvement is what helped mold the new Vias 2.0 and Verde 2.0 patterns and continues to give them a competitive advantage. Vias 2.0 is a macro camouflage pattern designed with light, medium and dark earth tones, which create visual deception at varied distances. Vias 2.0 features “shades of tan, grey, dark brown and black which lend themselves well to hillside type environments like you’d see in sheep country” says Hairston. Verde 2.0 is also a macro camouflage pattern with less contrast between the dark and light shades of color. This creates a pattern that is optimized for closer ranges, is very effective at longer ranges and also suits more universal environments. Rifles, pistols, pocket knives, trekking axes, and other multi-tools. Binoculars, headlamps, and other head wear. Coffee mugs, travel mugs, stainless tumblers, ice chests. KUIU® was founded in 2011 by Jason Hairston and features an unrivaled business model that provides premium mountain hunting products directly to the consumers who require them. By bypassing large retail establishments, the company is able to provide revolutionary products using the highest performing materials at a cost that is lower than comparable products in the market. KUIU partners with top manufactures around the world and is totally transparent with how and where they source the materials in their groundbreaking products. Low-density fabrics, water-proof breathable membranes, and the world’s first molded carbon fiber backpack frame are just some of the technological innovations that you will find in KUIU products. KUIU® continues to push the boundaries on what is possible in weight, performance, and value and as a result has become a top innovator in the hunting industry. Visit www.KUIU.com for more information.